Ixkun is a Maya site located in the Mopan river valley in Guatemala’s Péten Department, about 6.5 km north of the town of Dolores. Although primarily a Late Classic site, there is evidence that Ixkun was inhabited from the Preclassic into the Postclassic periods. The ruins have been known for some time and were first published in 1852 following a visit by Colonel Modesto Mendez and artist Eusebio Lara (Blom 1940; Graham 1980). Early interest in the site was perhaps due to the presence of an impressive and massive monument: Stela 1 which is one of the tallest monuments in the Péten (Laport and Mejía 2005: 158–159). Archaeologist Alfred Maudslay visited and mapped the site in 1887, spending a total of three weeks there (Graham 1980). His excavations at Ixkun are considered to be among the first formal archaeological digs within the Maya region (Laport and Mejía 2005). Sylvanus Morley and Herbert Spindon remapped the ruins in 1914, and conducted photographic documentation of known monuments (Graham 1980). Ian Graham also remapped the ruins in visits in 1971, 1972, and 1978 (Graham 1980). Since 1985 the site has been excavated by the project Atlas Arqueológico de Guatemala (Laport and Mejía 2005: 156). The site’s South Causeway, which unites two plazas with a particular building group, is 215 m long, 15 m wide and raised 1.3 m. At the southern end of the plaza is a raised platform which incorporates several monuments including Ixkun Stela 5 (Laport and Mejía 2005: 208). This monument was first recorded by artist Eusebio Lara in 1852 and a pen-and-ink drawing of the monument, probably by Lara, is housed in the library of the Society of Antiquaries of London (Graham 1980). The 2.65 m tall Stela 5 was commissioned by a ruler known as Rabbit God K around AD 800 and is made of white limestone. It was carved only on the front and depicted a male figure wearing an elaborate headdress and carrying a staff in one hand while scattering drops of liquid with the other. Beneath the figure were a hieroglyphic panel and a bound and seated war captive (Laport and Mejía 2005: 157). There were also hieroglyphics above the main figure and behind the prisoner. The stela was in good condition when it was discovered (Graham 1980). In 1972 the stela was damaged by looters who broke it into numerous pieces. Many of the pieces were stolen. Graham (1980) recounts that he returned to the site in 1972 specifically because of reports of the ruining of the stela. He believes that it was damaged less than 3 weeks before his arrival. Based on the evidence he found at the site, Graham believes that the looters built a fire around the monument to heat it and then doused it with cold water to force the piece to break (Graham 1980). Upon finding the scattered remains of Stela 5, Graham removed several of the remaining pieces to the village of Dolores (Graham 1980). Three of these fragments were later used as road construction material by the municipality (Laport and Mejía 2005: 208). To prevent further misuse of the Stela 5 fragments in Dolores, they were transferred to the custody of the Atlas Arqueológico project in 1989. The project also retrieved a remaining fragment of the stela from the site in 1991 (Laport and Mejía 2005: 208). The known pieces are now kept in the laboratory of the Atlas Arqueológico de Guatemala in Dolores. A piece of the stela that shows part of the hair of the captive is now in the Museo Nacional de Arqueología y Etnología (Laport and Mejía 2005: 208). The whereabouts of the looted fragments are unknown. Blom, Frans (1940), ‘Coronel Modesto Mendez’. Anales de la Sociedad de Geografia e Historia de Guatemala, vol. 16, Guatemala City. 167-179. Graham, Ian (1980), ‘Ixkun’, The Corpus of Maya Hieroglyphic Inscriptions. https://www.peabody.harvard.edu/CMHI/site.php?site=Ixkun#vol, accessed 28 February 2014. 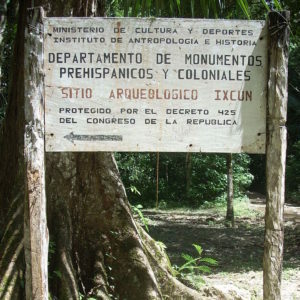 Laport, Juan Pedro and Héctor E. Mejía (2005) ‘Los monumentos esculpidos de Ixkun y algunos aspectos históricos del sitio’, In Ixkun, Petén, Guatemala: Exploraciones en una ciudad del alto Mopan, 1985-2005 (J.P. Laport and H. Mejía, eds), Atlas Arqueológico de Guatemala, Dirección General del Patrimonio Cultural y Natural, Ministerio de Cultura y Deportes, Guatemala. pp.156-217.